Tonight Omega expanded its -by now- vast collection of NATO straps with 24 new variations in celebration of the 2018 Winter Olympics. While most of them are very country-specific, I already spotted a few that I think will also look good beyond the Olympics. 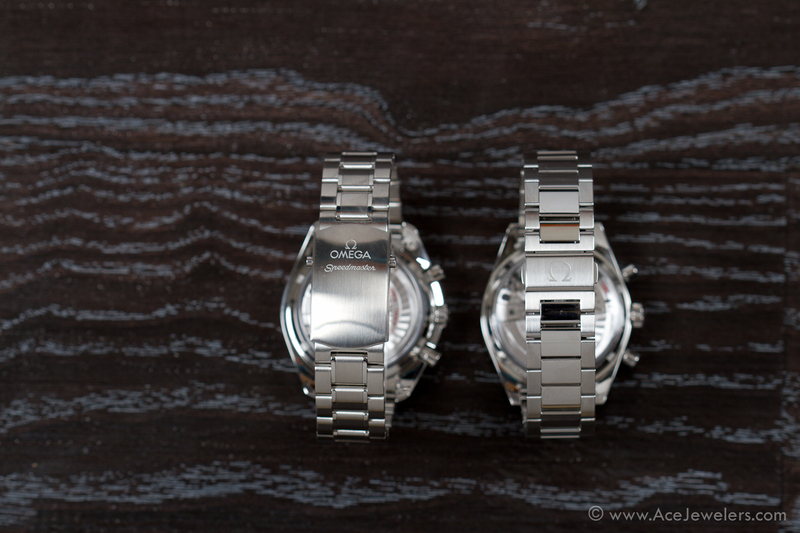 In this third installment of our Omega NATO update (part 1, part 2), I’ll fill you in on all the details. This entry was posted in Editorial, Speedmaster Automatic, Speedmaster Professional and tagged NATO on February 10, 2018 by Dale Vito. Do you remember? 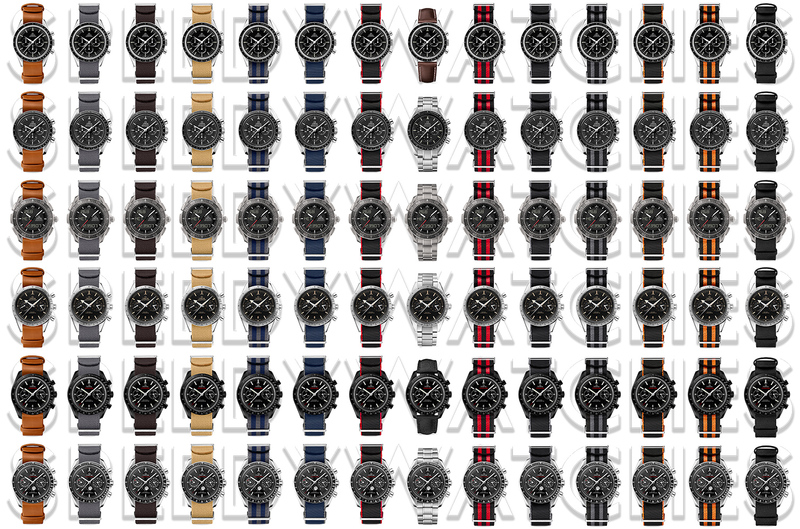 Back at BaselWorld 2014 Omega introduced their own NATO strap collection, and when they put up a dedicated page with all the info [quite] a few months later I wrote a detailed post on them. 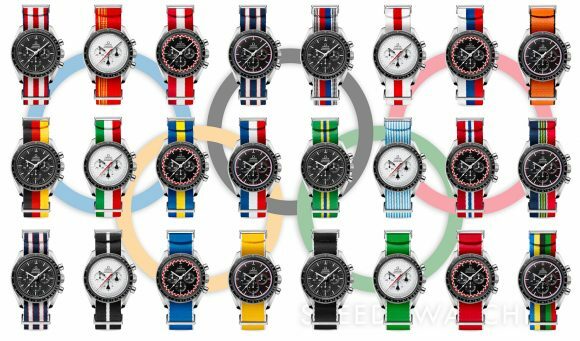 Today this is still one of the best read pages on SpeedyWatches.com! 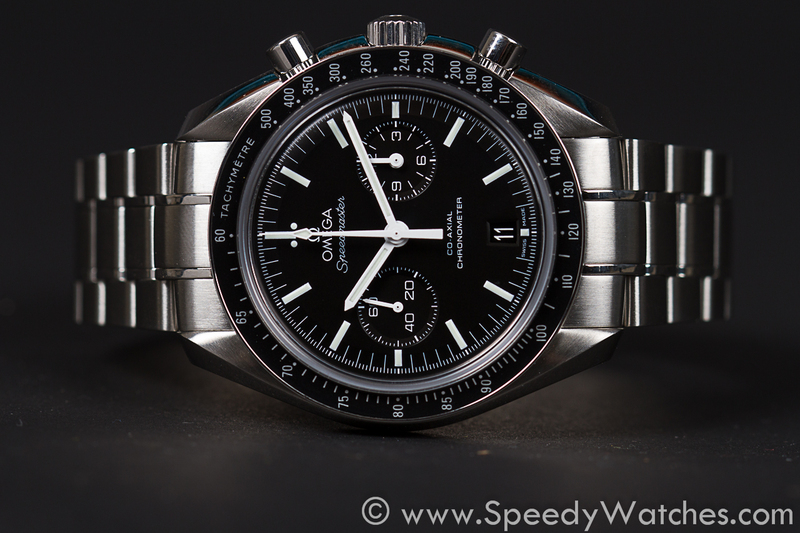 This entry was posted in Editorial, Speedmaster Automatic, Speedmaster Professional and tagged NATO on January 6, 2018 by Dale Vito. This article was originally published on August 12th, 2013. 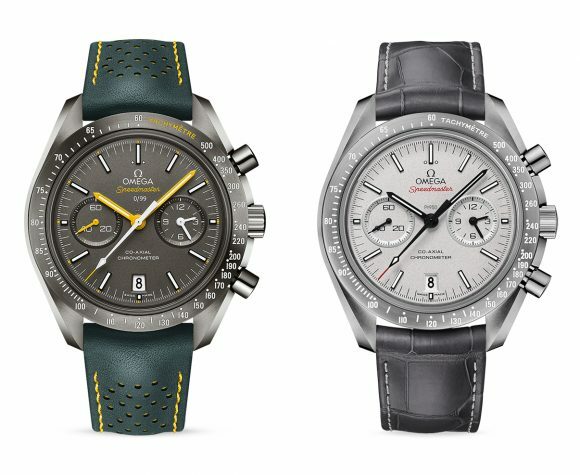 With pictures by our friends over at AceJewelers.com, we thought it time for a small comparison between the two versions of the Speedmasters powered by Caliber 9300 that are available thus far: the Moonwatch 9300 and the ’57 9300. You might have read in many reviews that the difference in size is quite big: 44.25mm for the Moonwatch versus 41.5 for the ’57. While to us it did appear that the ’57 is smaller at first glance, ‘less bulky’ might actually be a better term. Slimmed down perhaps. Or even trimmed down. The bigger 3:00 and 9:00 subdials create somewhat of a trompe l’oeil. In full-frontal the ’57 appears more refined, carrying less heft – the lugs appear to be considerably thinner and the lack of crown protectors plays a major role as well. But to cut a long story short – the bezel width is near identical, as is the dial opening. Most of the mm’s we think are shaved off the case-band. That is – said protectors and the famous Omega curve that the Moonwatch 9300 does possess. The bracelets couldn’t be more different, although both are based on the well-known three-bits-per-link design. The 9300 has the bracelet that we’ve come to know very well in the last two decades – with the subtle polished ridges on the mid links. The ’57 bracelet harks back to early bracelet used in the CK-2915, CK-2998 and other early Speedmasters. It seems rather elegant. It does feature huge polished areas, which we suspect are prone to desk diving marks. As seen in this 3:00 profile shot, there is little to no difference in height. 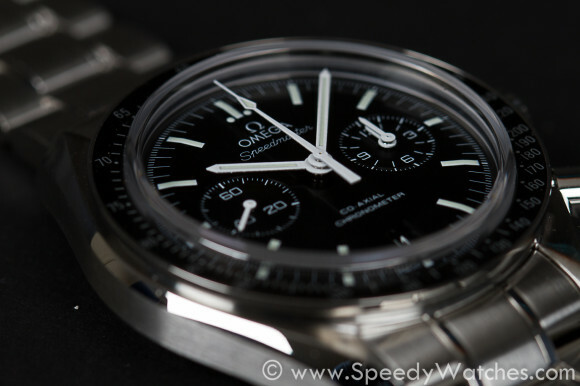 The ’57 measures in at 16.5mm, similar to that of the Moonwatch 9300. 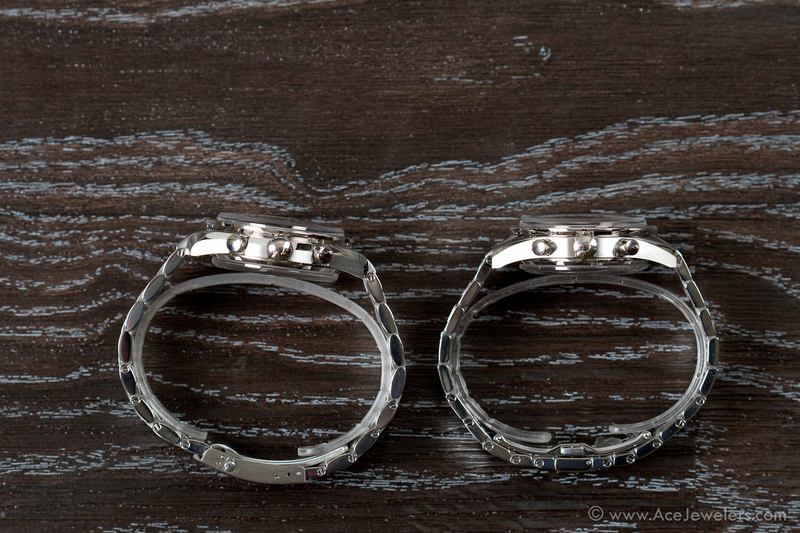 This shot in particular displays the more refined and slim nature of the new bracelet. It suits a watch that is an homage to watches from days gone by rather well we think. 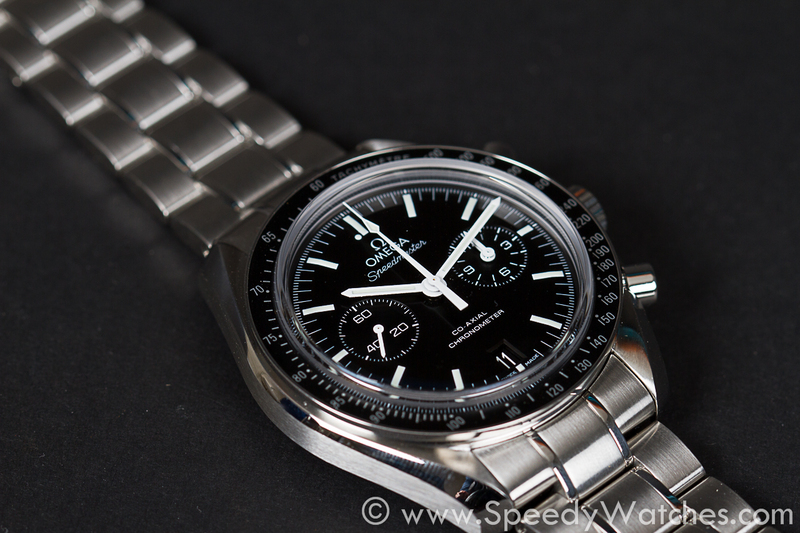 This entry was posted in Review, Speedmaster Automatic and tagged 311.30.44.51.01.002, 331.10.42.51.01.001, Co-Axial, Speedmaster '57, Speedmaster 9300 on December 23, 2017 by Dale Vito. This article was first published on June 29th, 2013. 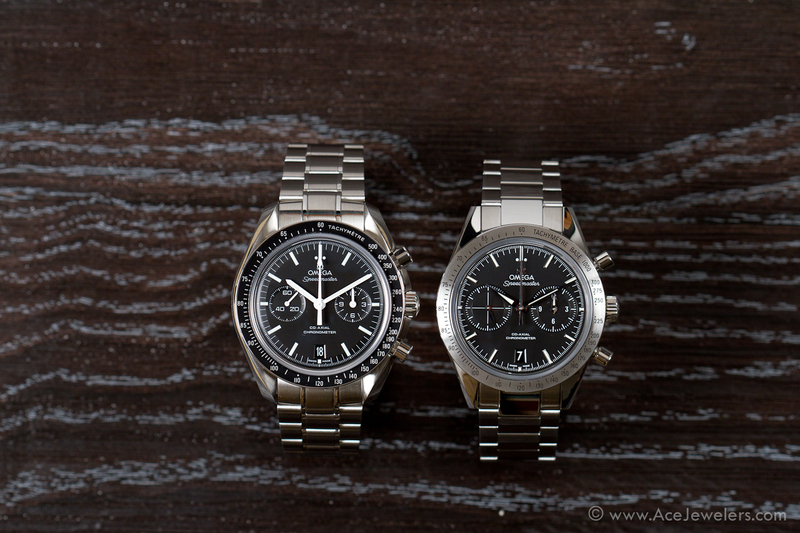 Omega introduced its first automatic Speedmaster in 1971, over 40 years ago. Since then, a lot of Speedmasters powered by automatic movements have been introduced, but very few of them have proven to be of satisfaction to true Speedmaster aficionados. How about the 9300? 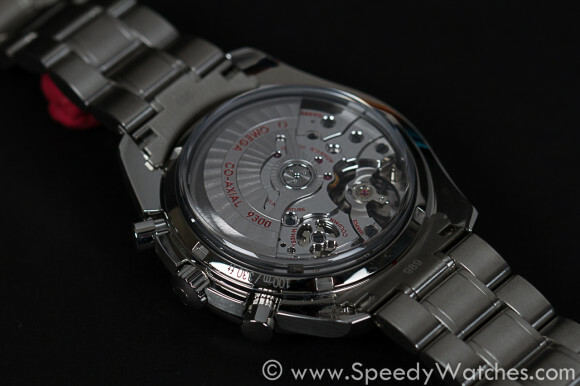 It is powered by an automatic manufacture movement: caliber 9300. Click the link for details on this movement. The minute and hour totalizers are combined in one single subdial at 3 o’clock. Recently we had the opportunity to play with the 311.30.44.51.01.002 (stainless steel on bracelet) for a few days, thanks to AceJewelers.com. So what are our experiences? The case size of 44.25mm may sound large, but it sits very well on even our slender wrists and doesn’t look that much bigger than a regular Speedmaster Professional. 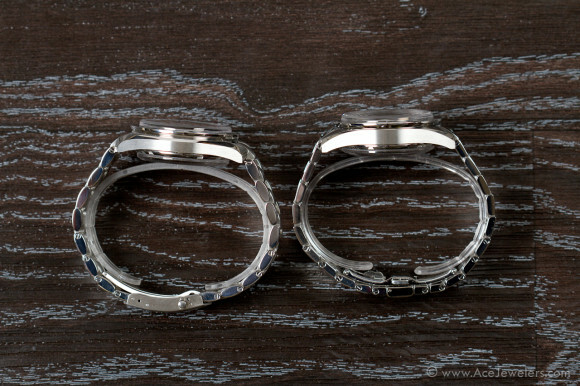 Due to the high sapphire case back, the mid-case hovers above the wrist and the crown and pushers never dig into the wrist. The weight with full length bracelet is 183gr. 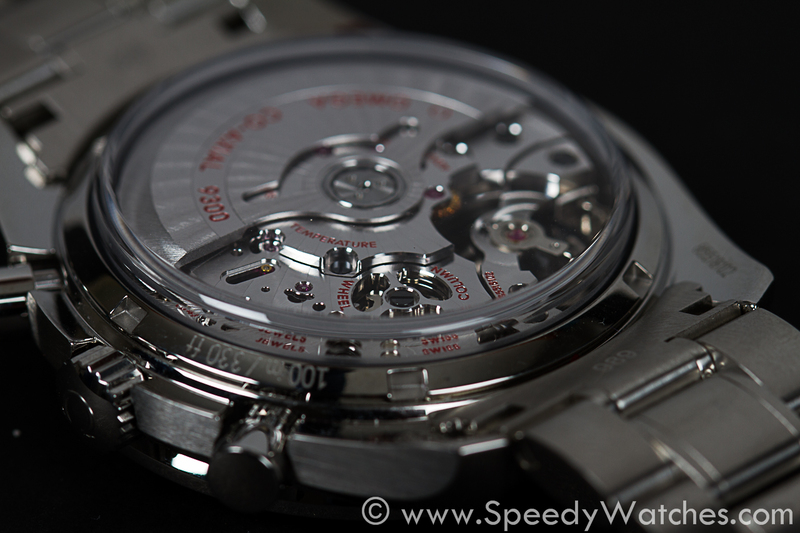 The movement, caliber 9300, is a joy to behold. Somewhat unusual is the quick set of the date, which has to be performed through the ‘timezone-function’ – by moving the hour hand forward in 1 hour increments. The chronograph action is very smooth. The pushers require the right amount of force, and the seconds starts without ANY jump. Why? Read this. It just looks smashing. The classic Moonwatch-look is such an evergreen that you just can’t go wrong. The column wheel and silicon balance spring visible through the sapphire case back. Omega did a great job on the caliber 9300 – it seems to have been designed with much thought. There’s a glimpse of the two barrels, the column wheel, the free-sprung balance et cetera – no cutting corners going on here! As indicated above, the design of the sapphire case back is quite unusual. 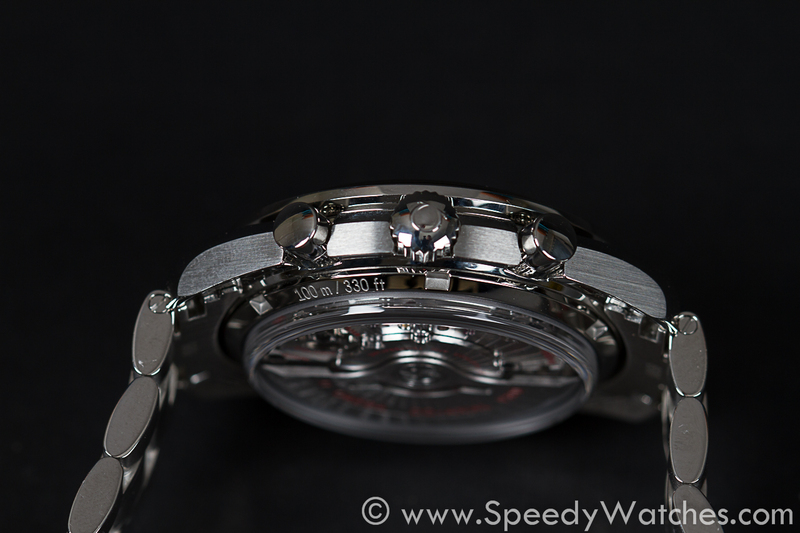 It pops out from the stainless steel part, making way for the rotor to make it’s swings. In the meanwhile, we get first row seats to the action. Would we buy one? YES. 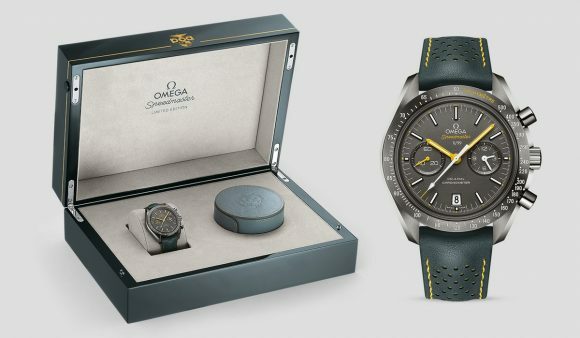 It seems Omega finally created a Speedmaster with automatic winding that is a great addition to the collection of a true Speedmaster afficionado. It looks smashing and has a killer movement – what else could we wish for? This entry was posted in Review, Speedmaster Automatic and tagged 311.30.44.51.01.002, Co-Axial, Speedmaster 9300 on December 14, 2017 by Dale Vito. Earlier today Omega and the Porsche Club of America introduced the Speedmaster Club of America (a.k.a. Speedy PCA). A limited edition of 99 pieces based on the Speedmaster Grey Side of the Moon, the Speedy PCA features a number of interesting changes to the original. I sometimes like to look at limited editions across brands and see which parts are actually different compared to the base models. With the Speedy PCA, the first thing that you’ll notice are the bright yellow accents, which are inspired by the yellow brake calipers found on high performance Porsche cars. But Omega didn’t just add a few dashes of paint and call it a day. In fact, the dial, the hands, the bezel, the case back and the packaging are all different compared to the original Grey Side of the Moon. The biggest change is found in the dial, which is now crafted from ceramised titanium rather than sand-blasted platinum, as indicated by the Ti engraving just above the center. 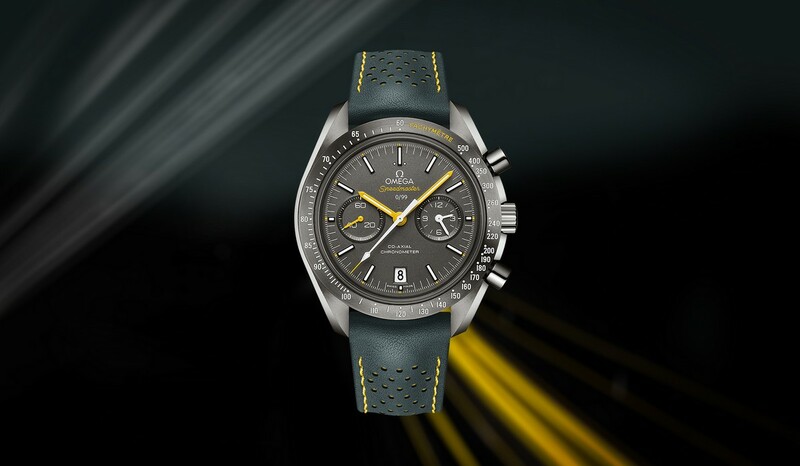 Yellow accents are abundant but not overwhelming; the color is found on the timekeeping hands, the tip of the chronograph seconds hand, the dial, the bezel, and the case back with the PCA logo. A strap similar to the one found on the 2017 304.32.44.51.01.001, though done in grey & yellow, and a special presentation box complete the package. 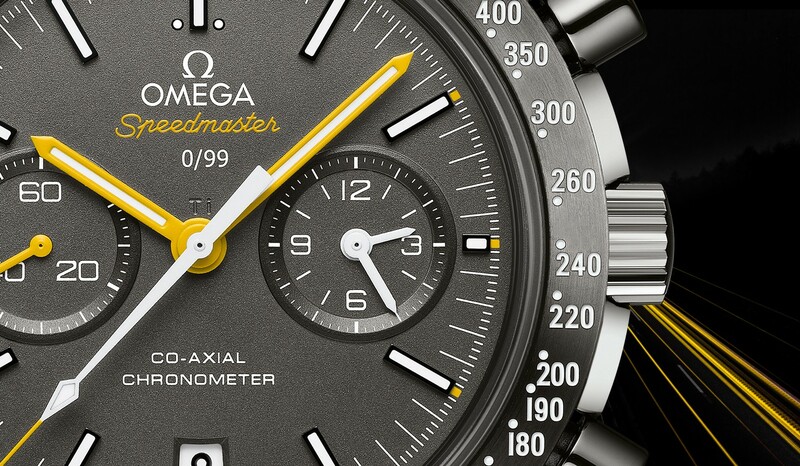 The Omega Speedmaster Grey Side of the Moon Porsche Club of America is available through PCA Time. This entry was posted in Editorial, Speedmaster Automatic and tagged 311.92.44.51.99.001, PCA, Porsche Club of America on November 11, 2017 by Dale Vito.